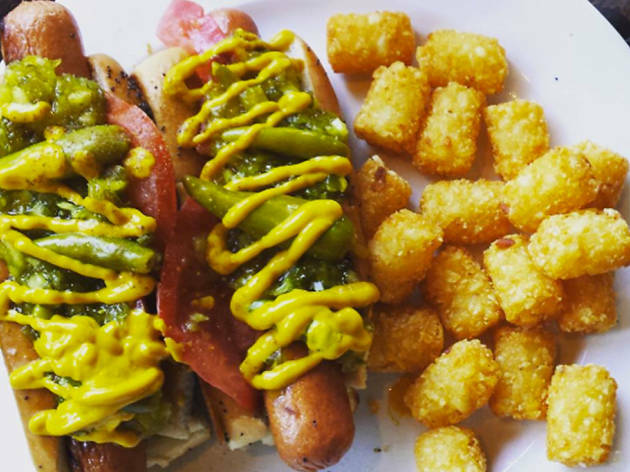 Hot dogs have gone the way of burgers—the classics remain, but kitchens around the city are taking tubular treats in bold new directions. 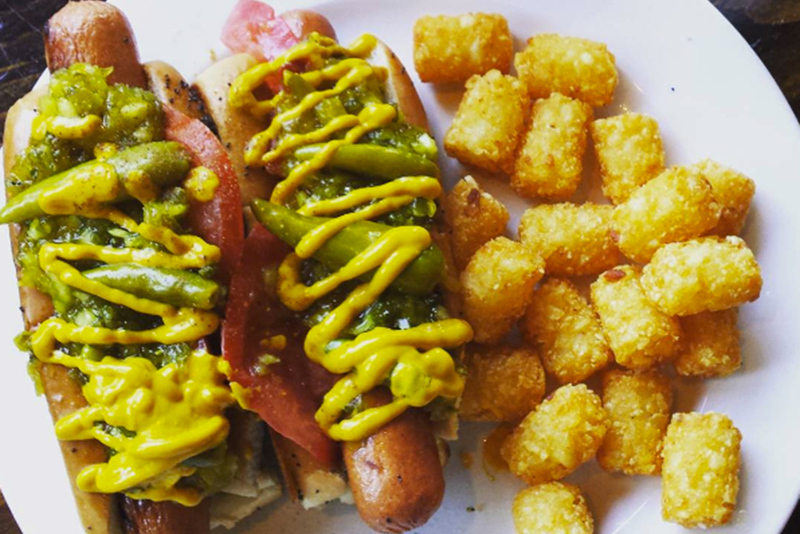 Even vegetarians are getting in on the game; some of the best vegan restaurants in Boston and best vegetarian restaurants in Boston churn out tasty, meat-free hot dogs. 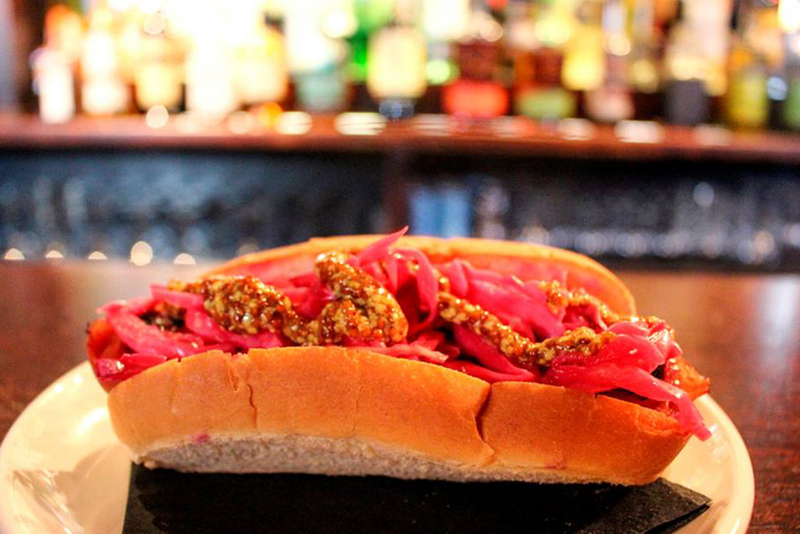 When you need a hand-held snack to fill your belly after a night of drinking at the best bars in Boston, here are the best hot dogs in Boston for to satisfy your cravings. 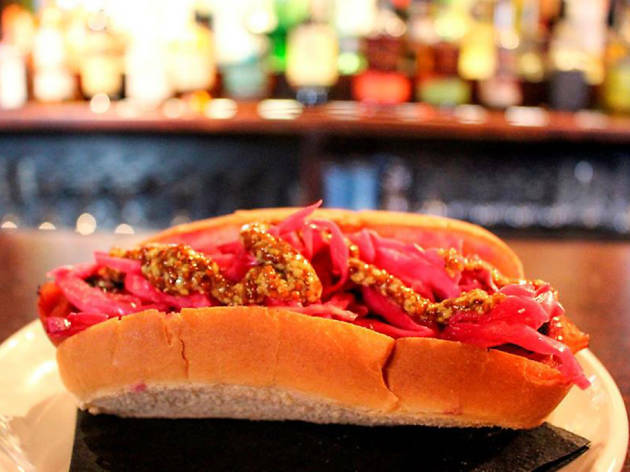 And if you haven’t jumped on the hot dog bandwagon yet, check out our guide to the best burgers in Boston. 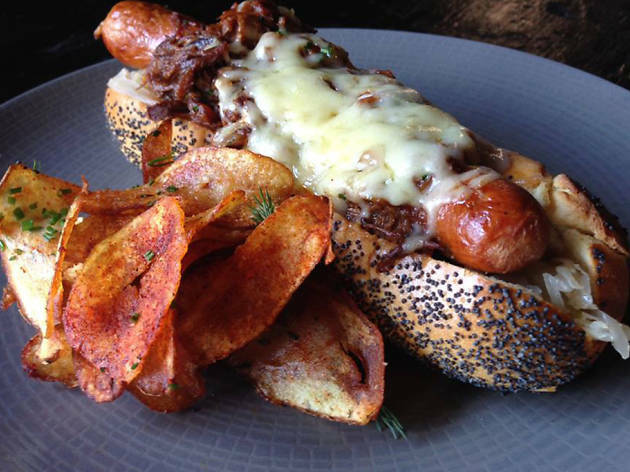 You can expect a special sausage at a German restaurant, and Bronwyn’s “Brondog” comes through. Pork and beef are blended into this frankfurter, which is served on a homemade potato bread roll. Chili, melted comte cheese, and gourmet ketchup and mustard take things to the next level. Don’t miss the other sausage-centric fare, like the footlong bratwurst with sauerkraut, potatoes, and mustard. 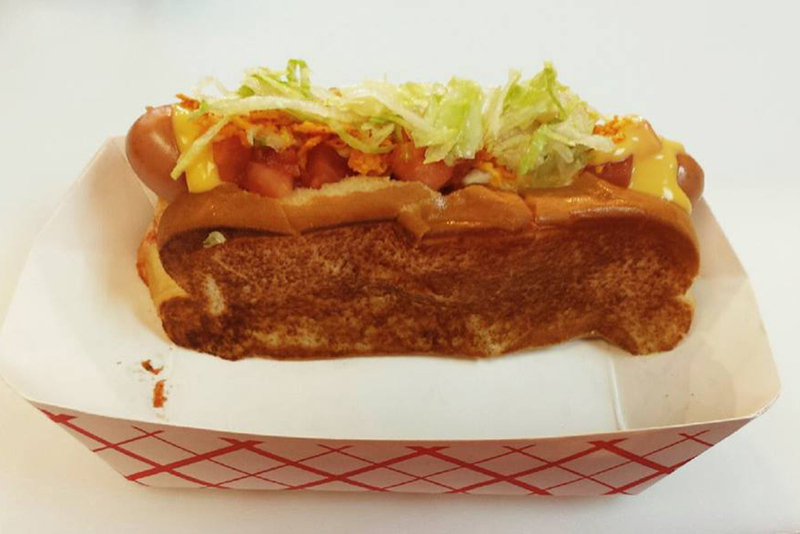 Fans of Trina’s love the comfort food, and the griddled hot dog options are no exception. There are six options on the menu, including a tofu pup and a corn dog. 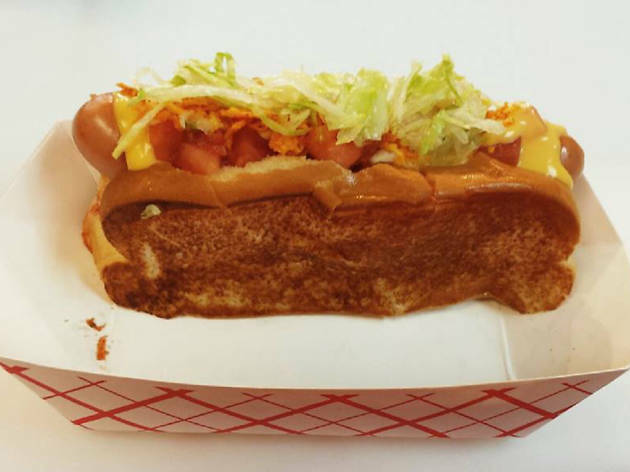 The chili cheese dog is the way to go, as is the dog of the day; mind-bending versions include a pancake-battered dog rolled in Frosted Flakes, then fried and finished with sriracha sea salt and maple dijon dipping sauce. 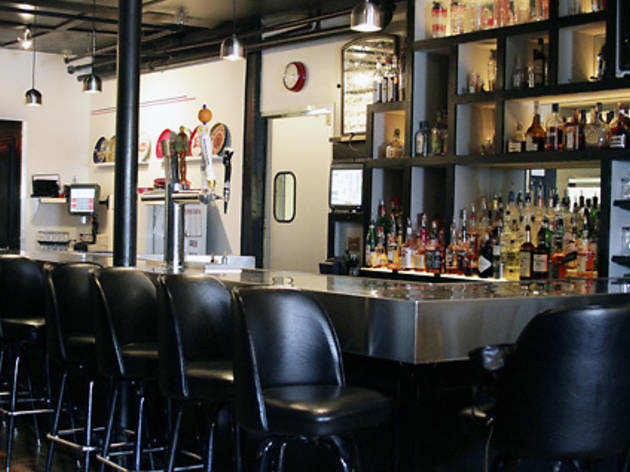 This hip izakaya from Tim and Nancy Cushman offers up cheeky takes on Japanese small plates. After a few rounds of tiki drinks or four-person scorpion bowls, the “Dogzilla” is just what you need. 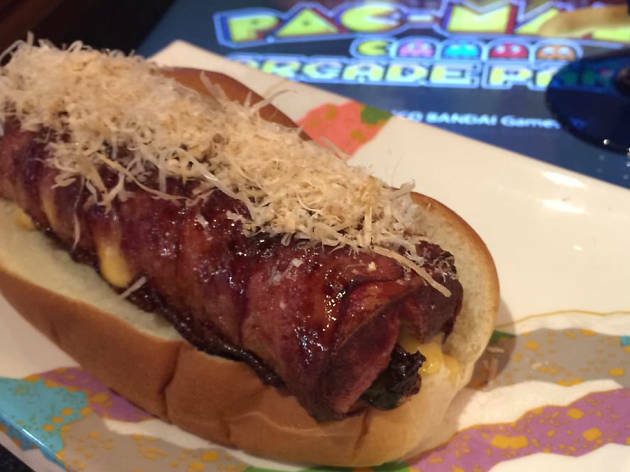 This dog is stuffed with cheese, wrapped in bacon, deep fried, then topped with kabayaki sauce and bonito flakes. Even Godzilla is no match for this flavor bomb. 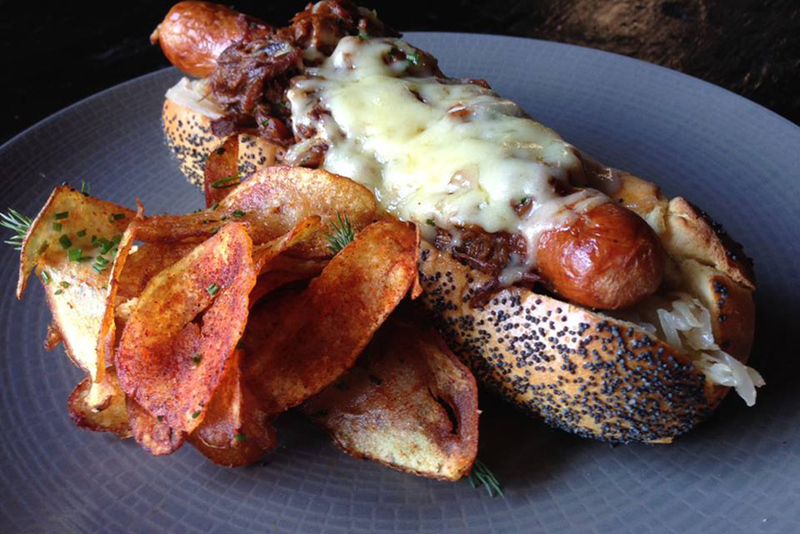 After a few attempts at giant Jenga, you’ll be ready to try Brass Union’s Choripan. 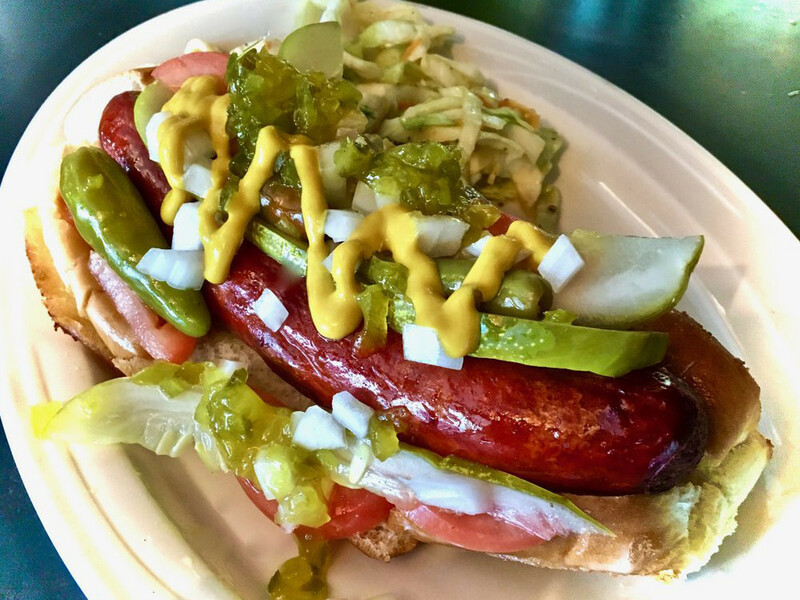 This Argentinian-style dog features chorizo on an open-face Portuguese bun, topped with chimichurri and scallions. 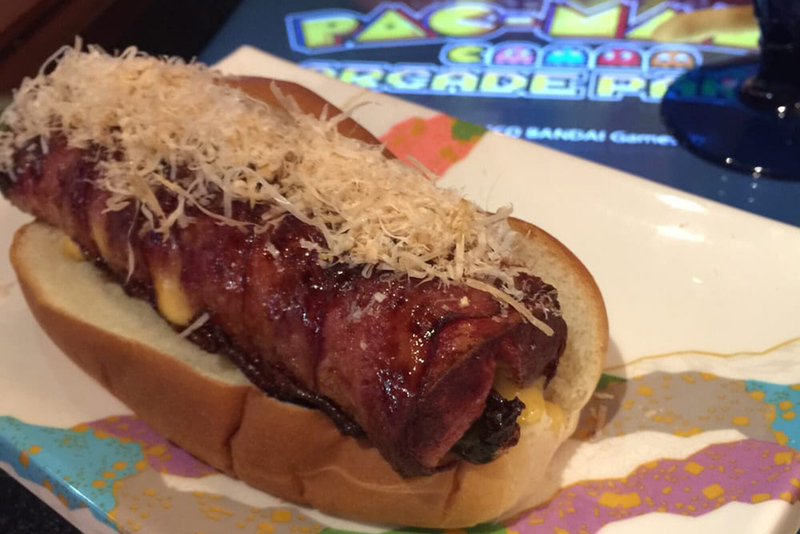 It might not look like your traditional hot dog, but it’s portable and full of flavor, and that’s what counts. 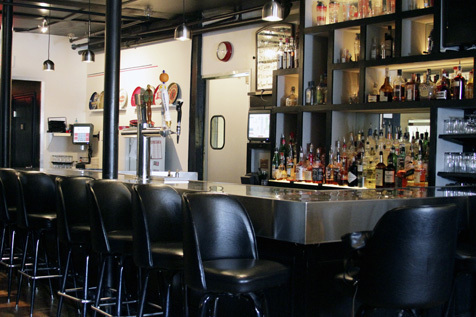 This hip Kendall Square bar specializes in classic cocktails and creative bar bites, but don’t miss the frankfurter. 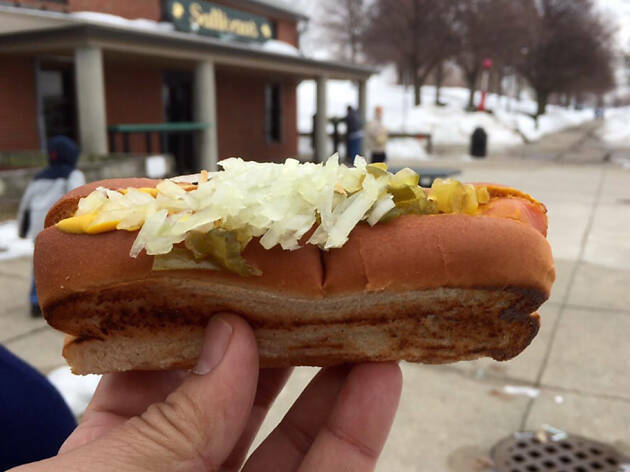 Enjoy an all-beef Pearl frank on a New England-style bun, or upgrade to a Green Dog (dragged through the garden, Chicago style), a Messy Dog (with onions, cheese, and chili), or the intimidating Atomic Dog—chili, cheese, onions, and the fiery “Inner Beauty” sauce. 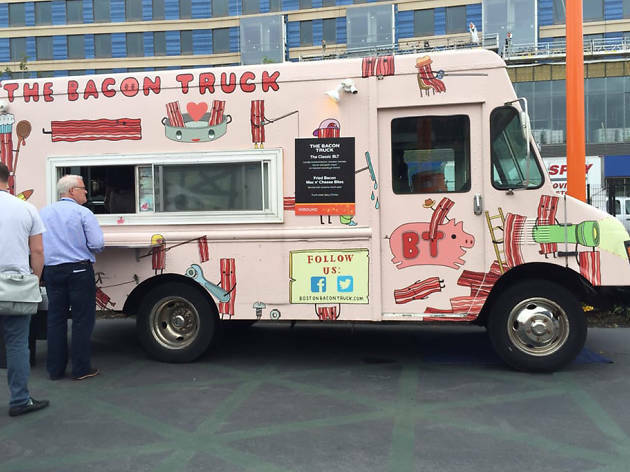 Bacon lovers eagerly track this pink truck on Twitter to find out where it will stop. Those who have experienced the special hot dog follow even closer, as this rare delicacy is usually announced mere hours before its appearance. 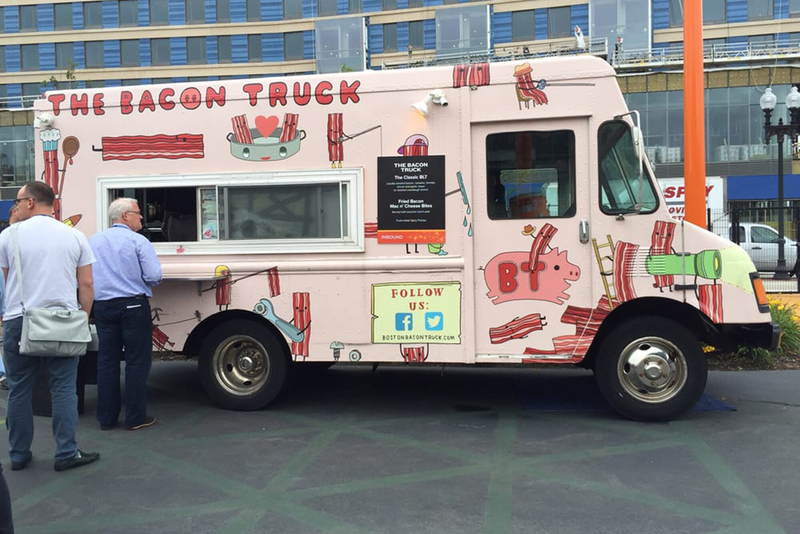 Wrapped in bacon and deep-fried, this is a dog worth waiting for, so keep your eyes peeled. 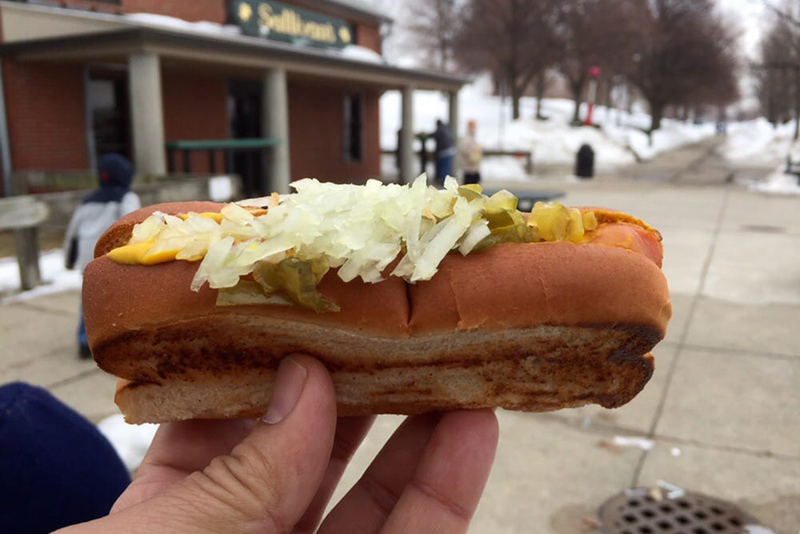 For a cheap, satisfying hot dog, head to Southie where Sullivan’s has been dishing them out for more than 60 years. The simple steamed weiner is served on a toasted bun for a mere $2.10. Enjoy it “all around,” with mustard, relish, and onion. For a few more coins, get one with chili and cheese. 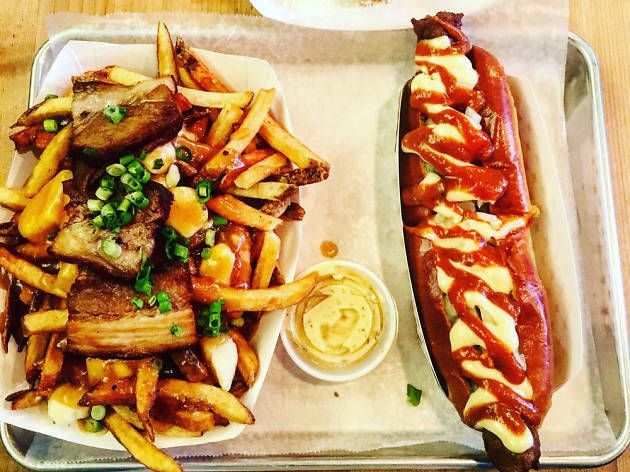 Saus is all about the fries and sauces, but their “friks”—beef and pork sausages—are also worth a try. Served on Iggy's brioche, they come in a few different varieties, incorporating the famous sauces of course. Try the spicy option, with pickled jalapenos and smoky chipotle sauce, or the “Burger...Kinda” option, with dill pickles, sharp cheddar, and secret sauce. Go big at this tiny Salem joint where there are plenty of options. (Natural casing or Kosher? Steamed or grilled?) Go for a black angus dog, chicken dog, or veggie dog. For the gluten-free crowd there’s a dog on a stick. For all others, the buttered and grilled roll provides a sturdy base for all the available specialty toppings, from bacon bits and pastrami to spicy peanut sauce. With all dogs under $10, this spot will satisfy everyone cheaply.